How was your Father’s Day? Ours was really fun. We celebrated with a BBQ with both fathers (mine and Dan’s) in attendance. We ate, we drank, and we played bocce ball. After my team won in a best of three series, Dan fired up the grill once again to make our dessert – grilled donuts! Grilled donuts with ice cream to be precise. The donuts are nothing fancy – just an assortment from Dunkin’ Donuts. There were glazed, chocolate glazed, and jelly filled donuts. Once the grill was hot, Dan cooked them just for a minute or so on each side, making sure to get some great grill marks. We let the donut sit for 30 seconds or so, then served a big scoop of ice cream with it on the side.You can use whatever ice cream you like best. We made ours, but store bought is just as tasty, and way less time consuming. 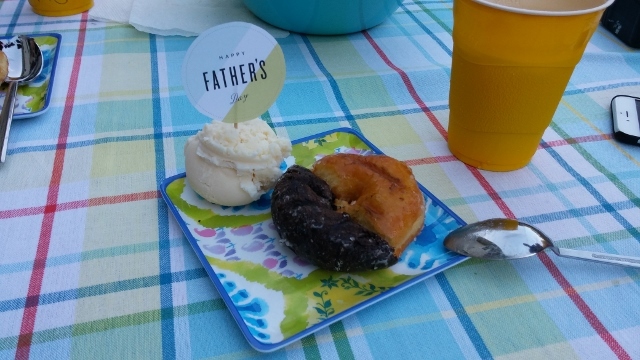 I quickly stuck a cupcake topper (made with this printable) into the ice cream of each father’s plate. Our parents were already trading donut halves before I could snap a photo! From that, I gathered that our easier than usual dessert went over well with our parents. We’ll definitely be serving this simple dessert again!